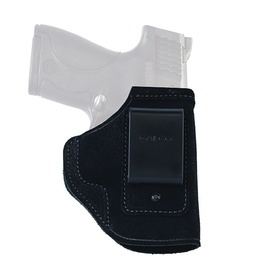 Open top allows a very fast draw while the reinforced mouth allows a smooth and easy return to the holster. 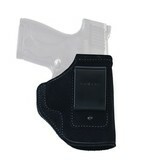 Sturdy injection molded nylon clip locks the holster onto the belt. Carries the handgun in a vertical orientation with no cant or angle and can be used strong side, crossdraw or in front of the hip (appendix carry). Constructed of comfortable premium center cut steer hide and fits belts up to 1.75 inch.